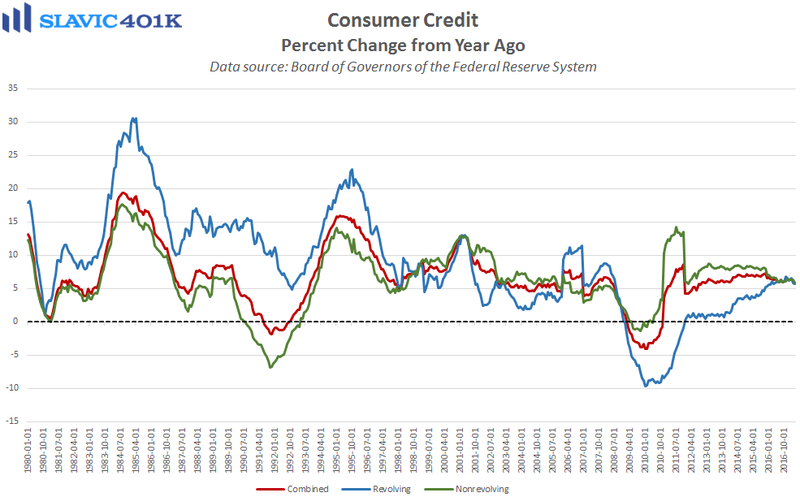 The latest report from the Federal Reserve Board of Governors on Americans’ borrowing activity showed that total U.S. consumer credit outstanding rose by $8.2 billion in April (lagged release) to $3,821.0 billion. That was the smallest monthly increase since 2011 and significantly worse than the $17.0 billion gain economists had expected. Non-revolving credit, e.g. student and automobile loans, rose by $6.7 billion in April, the 68th monthly increase in a row but the weakest growth recorded in almost a year. 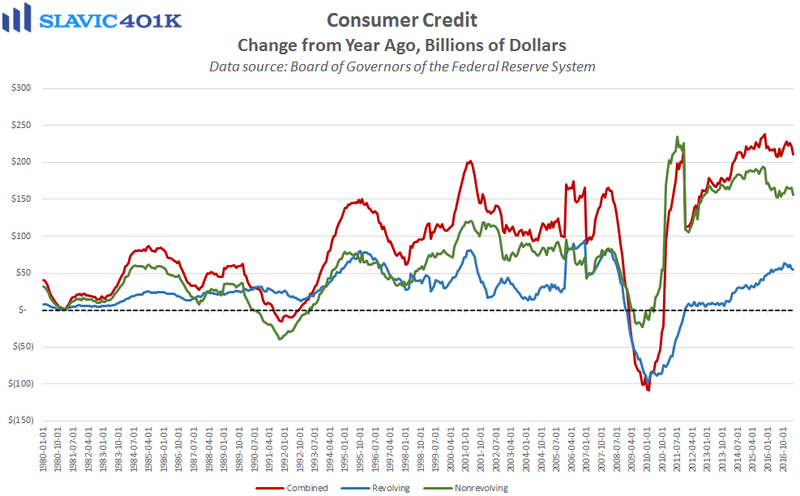 Revolving credit, which is mostly consumers’ credit cards, lifted by $1.5 billion to $1,010.6 billion in April, the smallest sequential gain since January. On a year-over-basis, every measure of consumer credit growth declined in April, with the headline figure falling to a nearly half-a-decade low. At the same time, the personal saving rate, i.e. personal saving as a percentage of disposable personal income, has jumped in this country by 0.8 percentage points in 2017. The uptick in savings, along with the recent slowdown in revolving credit growth, suggest that despite the post-election spike in consumer sentiment and continued strength in the U.S. labor market, Americans have generally become a lot more cautious with their money. That helps explain why real personal consumption (consumer spending) grew in Q1 at the slowest annual rate since 2009. Officials at the Federal Reserve, though, said that they believe such weakness is transitory, and many analysts expect to see a significant rebound in growth in subsequent quarters.